Cookie’s “Top Down Sock Design”class was fabulous. Which you all knew, right? I still have to go over my notes and do a proper blog post about some of the key points. There was lots of information for a 3 hours class. I took the new camera, but didn’t feel comfortable using it. I tried once and had trouble focusing. I need more practice to be comfortable enough to just shoot away like some bloggers do. Cookie is a wonderful teacher. She made everyone feel welcome and put us at ease with friendly questions. She uses fun phrases to describe the different technical parts of the sock design process. I will go into more detail about those tomorrow. Most of the information can be found in her book, “Sock Innovations”. The class helped clarify the information for me. The fun phrases will make it easier for me to remember the concepts better. 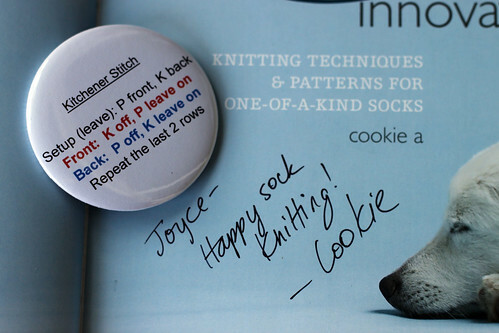 Cookie signed my book and then one of the other ladies in the class passed out Kitchener stitch buttons. I had so much trouble doing the toes on my last socks that I really need this button. I am beat and my head is spinning with information. I had a flat tire on the way home too. I wonder if the tire store people will let me practice photography tomorrow while I wait, or should I just take my knitting. This entry was posted on Monday, May 4th, 2009 at 3:00 am and is filed under Knitting. Tagged: Knitting. You can feed this entry. You can leave a response, or trackback from your own site. Take the knitting AND your camera! Can’t wait to hear more about your class…. !